BUY – TRAIN – WIN!!!! Everyone Welcome! No Entry Fees to Show! Six 2 year old horses will be sold in a Select Section of our Mid-Summer Horse Sale, at 1:00 pm. 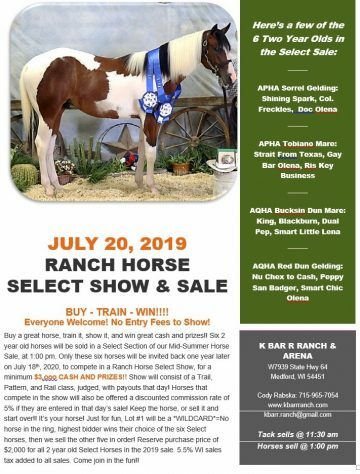 Only these six horses will be invited back one year later on July 18, 2020, to compete in a Ranch Horse Select Show, for a minimum of $3000 CASH AND PRIZES!! Show will consist of a Trail, Pattern, and Rail class, judged, with payouts that day! Horses that compete in the show will also be offered a discounted commission rate of 5% if they are entered in that day’s sale! 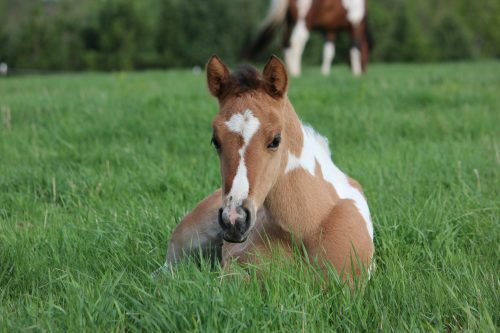 Buy a great horse, train it, show it and win great cash and prizes!! Keep the horse, or sell it and start over!! It’s your horse! Just for fun, Lot #1 will be a *WILDCARD*=No horse in the ring, highest bidder wins their choice of the six Select horses, then we sell the other five in order! Reserve purchase price of $2000 for all 2 year old Select Horses in 2019 sale. 5.5% WI sales tax added to all sales. All horses consigned to the Mid-Summer Horse Auction on Saturday July 20th, 2019 will be posted on our Facebook page. To list your horse for sale please fill out the Horse Sale Consignment Form and email the form to kbarr.ranch@gmail.com. Horses sell in consignment order, sale starts at 1:15 pm. All Consignments Welcome!! Consign early or day of sale, deadline 30 minutes prior to sale time. Over 80 new & used saddles: Custom Made/Hand Tooled, Barrel, Roping, Ranch, Trainer, Colt Starting/Working and English Saddles. New pads, saddle stands & racks, bridles, etc. Tack starts @ 9:00 AM. Tack sale in heated pavilion. 15% commission. Horses sell @ 1:00 PM. Horses sell in the Sale Barn. 8% commission, $80 minimum, or $30 No Sale Fee.